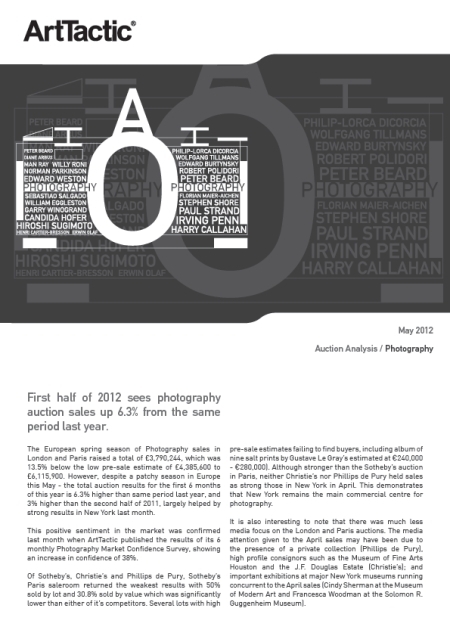 First half of 2012 sees photography auction sales up 6.3% from the same period last year. The European spring season of Photography sales in London and Paris raised a total of £3,790,244, which was 13.5% below the low pre-sale estimate of £4,385,600 to £6,115,900. However, despite a patchy season in Europe this May – the total auction results for the first 6 months of this year is 6.3% higher than same period last year, and 3% higher than the second half of 2011, largely helped by strong results in New York last month. This positive sentiment in the market was confirmed last month when ArtTactic published the results of its 6 monthly Photography Market Confidence Survey, showing an increase in confidence of 38%. Of Sotheby’s, Christie’s and Phillips de Pury, Sotheby’s Paris saleroom returned the weakest results with 50% sold by lot and 30.8% sold by value which was significantly lower than either of it’s competitors. Several lots with high pre-sale estimates failing to find buyers, including album of nine salt prints by Gustave Le Gray’s estimated at €240,000 – €280,000). Although stronger than the Sotheby’s auction in Paris, neither Christie’s nor Phillips de Pury held sales as strong those in New York in April. This demonstrates that New York remains the main commercial centre for photography.